The second round of the Hungarian parliamentary elections were held today, April 25. This runoff concerned only 57 of the country’s 176 direct single-member constituencies. To win by the first round, a candidate requires more than 50% of the vote and turnout must be over 50%. If no candidate fits this rule, a runoff is held two weeks later between all those candidates polling over 15% of the vote. A plurality is required in the runoff, and there is a 25% turnout minimum for the vote to be valid. A total of 119 candidates won by the first round two weeks ago. Two weeks ago, all voters also cast a vote for a party-list in 20 regional constituencies, where 152 seats are up for grabs through the Hagenbach-Bischoff system of PR. In addition to the 57 runoffs, 58 national list seats were also allocated today. No votes are cast for these national seats, which are allocated to parties to compensate for differences between their share of the popular vote and the amount of seats that they won through the district and regional lists. Fidesz won a strong victory by the first round, with 206 seats going to the party off the top two weeks ago. The runoff was covered much less by the mainstream international media, if covered at all, because it was relatively minor. Turnout was 64.38% overall in the first round, and the official numbers for today place it at 46.60%. But these turnout numbers, reported by the government, are misleading since they include technical 0.00% turnout in the 119 constituencies allocated by the first round. Turnout does seem much lower, though, in most constituencies with a runoff as well. Here are the quasi-final results, with around 98% of returns in. In brackets, you’ll see the ‘type’ of seats each party won with SMC standing for single-member constituencies, RL for regional lists and NL for national list. For reference, the ‘magic number’ in this election was 258: the number of seats needed to have a constitution-altering two-thirds majority. For comparison, Fidesz won 164 seats in 2006 against 186 for the MSZP (plus 6 joint MSZP-SZDSZ candidates). I have calculated the results overall of the 57 SMCs to be: Fidesz 54.59, MSZP 28.33, Jobbik 12.3, LMP 3.71 and Independents 1.07. Fidesz clearly did not lose much from one round to another, and it won all but two of the constituencies where it was leading in the first round. One shouldn’t take too much out of my calculated overall results for all runoffs because these runoffs were held in areas of Hungary where Fidesz is usually weakest. I don’t know the first round results solely for these 57 constituencies, but a look at individual constituencies does show that Fidesz increased its percentage share of the vote almost everywhere. The Socialists did pick up some speed as well, winning two constituencies, both in what seems to be areas of Budapest with lots of Soviet-era bleak apartment towers. A lot of the MSZP’s gains between the two rounds likely comes from LMP voters or better turnout on their side. On the other hand, Jobbik’s vote is down by varying amounts in almost all constituencies where it qualified for the runoff. This could also be the fact of Jobbik voters from the first round staying home, knowing that their party had little hope in their district in the runoff. The party’s leader, Gábor Vona, running in Heves-3, saw his vote share drop from 26% to around 20.3%. The LMP was qualified for the runoff in a number of Budapest districts, including a few where the MSZP apparently dropped out between the two rounds. In those districts, it pulled around 36-39%. Elsewhere in three-way runoffs, the LMP’s vote slid a bit compared to two weeks ago. In Borsod-Abaúj-Zemplén 8, an Independent won, likely on the votes of Jobbik, which seems to have dropped out of the runoff there. He is coloured green on the above map, which shows only the results in those constituencies holding a runoff today. The MDF and SZDSZ have been totally wiped out, which makes this election somewhat of a turning point from the 1990 era, since the MDF and SZDSZ were the two major parties right after the fall of the Wall and both represented the anti-communist opposition in 1990. Fidesz, which ran on a platform promising little aside from platitudes along the lines of “we’ll create a bunch of jobs” and “we’ll put the crooks in jail”, will find it especially hard to keep it’s voters, which are plentiful after these elections, happy. Predicting the 2014 election is a bit crazy as of now, but I’d be betting something on a return to power of the MSZP by then. Fidesz’s task includes putting the Hungarian economy back on its feet, something that will require foreign loans and investments, without playing against the strong nationalist sentiment which Jobbik will continue to exploit. On the foreign scene, Fidesz, which is historically far more ‘Greater Hungarian’ in its outlook than the Socialists are, might lead to a further worsening of relations with Slovakia, whose government is, on its side, heading down a road of Slovak nationalism and alienating Hungarians living in Slovakia. Austria held a presidential election today, April 25. Austria’s President holds a largely ceremonial office, notably in charge of officially appointing a Chancellor. However, unlike in Germany, Austria’s President is directly elected by voters for a six-year term in a classic two-round system. Most hot presidential contests in Austria happen when the incumbent retires, when it is usually contested by the main parties. The last such incidence was in 2004, when incumbent President Thomas Klestil was term-limited after two terms in office. At that point, both of Austria’s major parties, the Social Democratic Party (SPÖ) and the People’s Party (ÖVP) contested the election, which was narrowly won by Heinz Fischer of the SPÖ. Presidents running for re-election usually face no major opposition, save for opposition from smaller parties on the far-right or the Greens. In 1998, for example, Klestil, a member of the ÖVP, was re-elected with the support of the SPÖ and the far-right FPÖ against three other opponents, including a Green and a Liberal. Heinz Fischer, like most of his predecessors, built up tremendous popularity while in office, likely due to the non-confrontational nature of the office. Despite the SPÖ’s series of electoral trouncings in 2009, Fischer’s popularity broke party lines and the ÖVP could not hope to field a strong challenge. Indeed, the ÖVP’s most likely candidate, Lower Austrian Governor Erwin Pröll announced in late 2009 that he would not run and the party officially endorsed Fischer in February 2010. The Greens, who were considering fielding their former popular leader Alexander Van der Bellen as a candidate, finally decided to endorse Fischer as well. On the far-right, the FPÖ announced early that it would field an opponent to Fischer. However, since the FPÖ’s young leader, Heinz-Christian Strache is focusing on the Vienna state elections later this year, he did not run but he announced in the Kronen Zeitung (the FPÖ’s mouthpiece, for all intents and purposes) that Barbara Rosenkranz, a state deputy in Lower Austria and a known far-rightist, would be the party’s candidate. Rosenkranz, it was thought, would have more appeal to traditionally conservative voters, while Strache is more popular with young and working-class voters. Rosenkranz is a polarizing figure, given her marriage to a neo-Nazi and her controversial position on immigration, the EU and Austria’s anti-Nazi legislation. The BZÖ of the late Jorg Haider, which has seen its fortune dwindle due to scandals in Carinthia, division and civil war in the party’s Carinthian stronghold, considered fielding Haider’s widow but decided against it. A final candidate emerged from the fringes, Rudolf Gehring of the Christian Party (CPÖ), which is a Christian fundamentalist outfit and shares some of the far-right’s anti-immigrant rhetoric. Turnout was 49.2%, including a record 7.3% spoilt ballots. This reflects well the apathy of voters vis-a-vis an unimportant election for a ceremonial position, but also the abstention of many ÖVP voters, not fond of the Social Democrat Fischer, the quasi-Nazi Rosenkranz and the fundie Gehring. The high amount of spoilt ballots likely comes from ÖVP voters as well. Fischer’s results are remarkably similar throughout Austria (a low of 67% in one district, with highs of around 89%), and the FPÖ did relatively poorly in areas where the bulk of its vote comes from old working-class voters, showing Rosenkranz’s weak appeal to that demographic. Even in Vorarlberg, where the FPÖ polled around 25% in last year’s state election, Rosenkranz won only 8.1% of the vote, while Gehring took 10.8%. Gehring did best in western Austria, which is traditionally rural, Catholic and a stronghold of the ÖVP. It shows well that the vast majority of Gehring’s vote came from ÖVP voters. Rosenkranz won her best result, 20.8%, in Carinthia, which isn’t very surprising. Overall, Fischer did surprisingly well in western Austria as well, either due to the flukes of low turnout or Rosenkranz’s poor appeal to FPÖ voters here (or the result of extrapolating too much stuff about results in such an election). Sri Lanka voted on April 8 to renew all 225 seats in the Sri Lankan Parliament, but two districts in Kandy and Trincomalee District held a re-vote on April 20. As a result of the re-vote, Kandy’s seat 12 district seats and Trincomalee’s 4 district seats were allocated as well as 29 top-up national seats elected by proportional representation. I posted the preliminary results earlier here, in a post which also includes information on the political coalitions. As a reminder, before the re-vote, the UPFA stood at 117 seats against 46 seats for the UNF, 12 seats for the TNA and 5 seats for the DNA. The Economist‘s projection of 142 seats overall for the UPFA was close to the final tally of 144 seats. The party falls short of the 150 seats two-thirds majority which would allow it to change the constitution, but as said previously, it is likely that opportunistic opposition MPs will be more than happy to join the government’s ranks for the advantages and spoils of power. The opposition MPs most likely to defect are probably those members of small parties allied with the UNF or the Sinhalese nationalist-communist Janatha Vimukthi Peramuna, which was allied with the DNA this time but was a member of the UPFA’s 2004 coalition. What’s going on in the British Isles? I wanted to wait a bit until making an election preview post for the UK’s May 6th general election, something you probably all know about and are following with passion anyway. But the recent craziness of the electoral campaign and polling in the British Isles has forced me to do otherwise. A certain yellow party was polling between 20 and 22% a week ago, and now this same party is polling 30-33% and is even leading in some polls. What’s going on? Nobody knew who Nick Clegg, the MP for Sheffield Hallam was, so his message of a third-way alternative to Tories and Labour didn’t resonate much but he did get the LibDems out of the polling straits they had been under Ming Campbell (as low as 13%). Yet, his message was and is one that can work. The idea of a fourth term for Labour, already in power since 1997, isn’t an appealing prospect to the majority of Britons and the Tories, rejuvenated under their young leader David Cameron, have led in polls since Gordon Brown took office in 2007. Yet, the enthusiasm of Cameron’s first days in leadership have worn down and the Conservatives aren’t as popular as they were back in 2006 or 2008. The recent expenses scandal in 2009 has hurt all sides, especially Labour, and has led to a generalized feeling of discontent with politicians and the two big parties, a discontent expressed in June 2009 by the high vote for the UKIP, BNP and Greens in the European elections. The first ever televised debates between the big 3 leaders was held on April 15, and two others will be on April 22 and 29. This debate was the opportunity for Clegg, unknown to voters, to gain notoriety. And that he just did. He easily won the debate against Cameron and Brown, who did poorly. The result was huge. All polls since the debate have them over 29%, and up to 33% in some. YouGov on April 18 had them first with 33% against 32% for the Tories, while Labour is polling far behind in third place with 26% in YouGov’s poll but as low as 24% in today’s Angus-Reid (though Angus-Reid is more like ‘Tory-Reid’) poll. A lot now depends if Clegg lives up to high expectations set for him for the two last debates. But there seems something lasting in this LibDem bump, and it is now extremely unlikely the LibDems will see a net drop in their share of the vote or seats nationally vis-a-vis 2005. Playing around with the universal national swing (UNS) is always a stupid idea since it assumes that all seats will swing by the same amount on election day, which for is, for all intents, impossible. But with the craziness now, and since the LibDems are a party with some weird voting patterns, it’s even stupider. But it seems that on most of these polls, Labour would be the largest party in a hung parliament followed closely by Tories. Both would hold between 240 and 260 seats. The LibDems would win around 100 to 125 seats. The cool swingometer map on UKPollingReport shows that the LibDems would be strong in the southwest, especially in Cornwall (where they hold all seats already) and Devon. May 6 will be fun, no matter what. But a likely very divided result could either lead to electoral reform because of a deal between LibDems and either Tories or Labour or to a new dissolution for a late 2010/early 2011 election if Tories and Labour don’t commit themselves to electoral reform, which will likely be the main demand of the LibDems after May 6. Their old plea for electoral reform will be strenghtened by the unproportional result of this election. The unrecognized Turkish Republic of North Cyrpus (TRNC) held a presidential election on April 25, 2010, at the conclusion of the five-year term. In North Cyprus, the President is usually the more powerful figure and is the dominant position in politics. The incumbent President, Mehmet Ali Talat was first elected in 2005. Political debates in North Cyprus obviously revolve very much around the question of reunification with Cyprus. The National Unity Party (UBP), which has dominated the TRNC’s political life for most of its existence, opposes reunification and supports a two-state solution. The main opposition, the Republican Turkish Party (CTP) on the left favours reunification. The UBP and its longtime leader, former President Rauf Denktaş (in power 1975-2005), were quasi-omnipotent in Northern Cypriot politics until Cyprus’ accession to the EU and the continued marginalization of the TRNC led to the victory of the CTP in the 2003 and 2005 legislative elections and Mehmet Ali Talat’s election as President in 2005 following Denktaş’s retirement. However, the lack of progress on the reunification issue since the defeat of the 2004 Annan Plan have probably led to a lower apetite for reunification within the population, and the UBP led by Derviş Eroğlu won the 2009 legislative elections and Eroğlu became Prime Minister. Prime Minister Derviş Eroğlu was the UBP’s candidate, and received the support of the Democratic Party, which holds 5 seats in the TRNC’s Assembly. Incumbent President Mehmet Ali Talat ran for re-election with the support of the CTP. Eroğlu’s victory marks the end of CTP power in the TRNC, an era which lasted from around 2003 or 2005 until 2009 or 2010. The UBP now controls all levers of power, the only question now being the status of reunification talks. Eroğlu’s victory is unlikely to spell a total end to these talks, but they may slow down or be stalled by the TRNC’s more independent attitude. It will be interesting to see how the likely slowdown of reunification talks will affect politics in Cyprus, where incumbent pro-reunification Communist President Dimitris Christofias was elected in 2008 in a campaign where the issue played a large role and led to the first-round defeat of hardline anti-reunification incumbent Tassos Papadopoulos. Christofias and Talat, both leftists with trade union history, were on good terms, but it remains to be seen if this peaceful attitude can continue in relations between the two warring factions on the island. Sri Lanka voted on April 8 to renew all 225 seats in the Sri Lankan Parliament, an election held six years after the 2004 legislative elections and a bit more than two months after the January 26 presidential election. These are the first legislative elections since the end of the 30-year civil war with Tamil rebels in the north and east of the island off the coast of India. Sri Lanka’s Prime Minister is less powerful than the President, but the 2004 legislative elections and the victory of Mahinda Rajapaksa’s left-leaning United People’s Freedom Alliance (which includes the Sri Lankan Freedom Party, an old Sinhalese left-nationalist party) over the incumbent centre-right United National Front led by then-Prime Minister Ranil Wickremasinghe signaled both a shift within the island’s Sinhalese majority to a tougher stance against the Tamil rebels but also Mahinda Rajapaksa’s election as President over Ranil Wickremasinghe the following year, in 2005. Mahinda Rajapaksa’s UPFA has reaped the benefits of the defeat of the LTTE in 2009, and voters thanked him in January with a crushing 58-40 defeat of his main opponent, former General Sarath Fonseka, then standing for the UNF in an attempt to prevent Rajapaksa from taking all the credit for the LTTE’s defeat (Fonseka had been a major general in the late conflict). Of the Parliament’s 225 members, 196 come from 22 multi-member districts while 29 national list seats are allocated proportionally to the votes cast. The opposition parties to the UPFA, which includes the UNF but also the Tamil National Alliance (TNA) and the communist Janatha Vimukthi Peramuna (JVP), had come together in January to support Fonseka’s candidacy, but the alliance has since broken down. The UNF, led again by former Prime Minister Ranil Wickremasinghe, is contesting as is the Tamil National Alliance and the National Democratic Alliance (NDA), a coalition led by Fonseka including the JVP. In Sri Lanka’s proportional system, no party has come close to achieving the two-thirds majority needed for changes to the constitution since 1977, when a UNP (United National Party, now a member of the UNF) government changed the constitution, thanks to its huge majority, to create a powerful presidency. The JVP quit the UPFA in 2005, but various outfits allied in 2004 to other coalitions joined the UPFA coalition since then, giving it a majority. The UPFA does not have an overall majority on these numbers, and The Economist believes that the UPFA will end up winning 142 seats overall, short of the 150 needed to change the constitution (which in this case means something, since Rajapaksa has openly said he’d like to change it). Turnout was rather low everywhere, but especially in the Tamil areas (like in the 2010 presidential ballot). There was a low of only 23% turnout in Jaffna (compared to 47.4% there in 2004), historically the LTTE holdout and an area which is around 99% Tamil. As a result of this low turnout in Tamil areas, the TNA, which won 22 seats in 2004, did poorly this time around and does not dominate all-around in Tamil areas on these turnout levels. The TNA will need to re-invent itself somehow and take the consequences of the end of the civil war on the population. The UPFA’s lack of a constitution-altering mandate on these numbers isn’t definite. A number of opportunistic ‘opposition’ MPs are already tempted to join the UPFA ranks and reap the benefits of power. This could give Rajapaksa his two-thirds majority, something which the opposition and the world fears he, rather keen on personal power and authority, could use to establish a more authoritarian regime on the island. 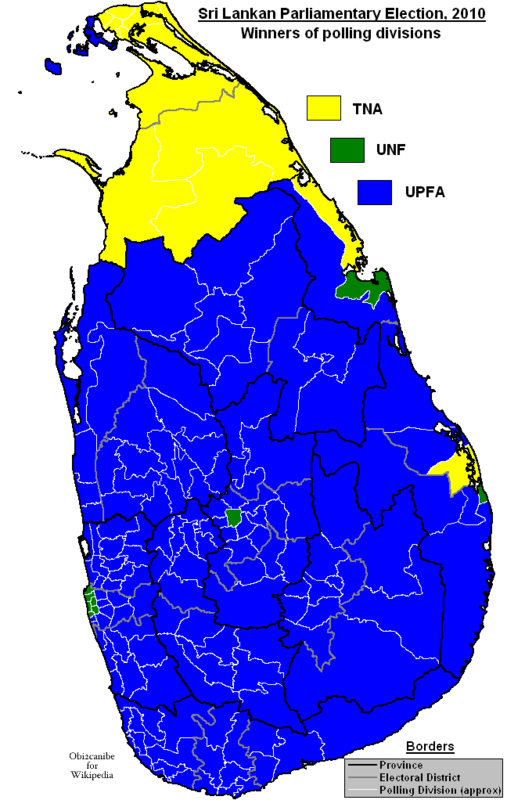 According to Wikipedia’s map (on a side note, Wikipedia now has election maps for all Sri Lankan legislative elections since 1977), the UNF was limited in this election to only a few urban districts in Colombo, the nation’s political and economic centre; and two other districts including one in central Sri Lanka. The UNF has historically done well in central Sri Lanka, likely due to the high proportions of Indian Tamils (they form a majority in Nuwara Eliya District). Unlike the northern and eastern Tamils, native to the island, Indian Tamils were originally brought from India to work in Ceylon’s tea, coffee or rubber plantations, which were historically in the hills of central Sri Lanka. The first round of the Hungarian parliamentary elections were held yesterday. This first round allocated all 152 seats elected through proportional representation on the basis of votes in Hungary’s 20 regional constituencies. The first round in 176 single-member constituencies was also held. To be elected by the first round, a candidate requires 50% of the vote with a turnout superior to 50%. If no candidate meets this requirement, a runoff is held between all those candidates polling over 15%. 119 of the 176 single-member constituencies were filled by the first round, therefore the runoff will only concern 57 seats. 58 additional seats, called the national seats, will be allocated to compensate parties whose popular vote is inferior to their percentage of seats overall. These national seats are not elected directly per se. Turnout was 64.38% overall. Here are the results. The map below shows results by single-member constituency. I’m not sure what these percentages refer to, but I assume it’s some amalgamation of the list vote and the ‘direct vote’ if you will. Fidesz wins a strong result by the first round, but does fall far from the 60% of the popular vote predicted by most pollsters, mostly to the narrow benefit of the MSZP and somewhat in favour of Jobbik and the Greens (LMP). They have a lead in all regions and all but one constituency in the direct vote (only a working-class Budapest constituency, red on the above map, escapes its reach), and they are favoured in a majority of runoffs in these direct seats. On these figures, it seems that Fidesz could manage to get a two-thirds majority, but only just. The Greens (LMP), with around 7.5% of the vote, do better than what pollsters had given them (5-6%) and enter Parliament. It is remarkable that such a young party with little major media coverage and so forth can enter Parliament, but the collapse of the MSZP and SZDSZ allows for those major gains. Jobbik, unlike in the Euros, was not massively understated, showing that it’s become acceptable to be an open Jobbik supporter with pollsters, largely because the party is more established since the Euros, when it still was rather unknown. Jobbik’s polling gains, from 2% to 16%, are in fact recent, from the start of the troubles in financeland more than the 2006 lies scandal. Yet, Jobbik also polls slightly better than in 2009 (14.77%), while Fidesz polls considerably worse (56.36% in 2009) while MSZP polls slightly better than in 2009, when it polled 17.37%. MDF loses all seats, as does SZDSZ, both parties being the key parties of the immediate period following the fall of communism in Hungary. It certainly represents the end of an era, and the disappearance of SZDSZ also represents a major backlash against moderate, liberal and internationalist parties in favour of more nationalist parties (Fidesz is slightly nationalistic on a few themes, but obviously Jobbik is the main nationalist party). MSZP is strongly favoured in perhaps one constituency (Budapest 20), where the runoff will oppose it to Fidesz only. It does best in Budapest, with 25.33% and also in Komárom County with 23.39% (I think there is some mining industry there of some sort). They also do well in the southern working-class city of Szeged, near the Serbian border. Jobbik does best in the counties with the highest Roma population, with 27.2% in Borsod-Abaúj-Zemplén which is the county with the largest Roma population in Hungary, around 7% or so in all. Its results there and in surrounding areas goes up to 30% or so. Gábor Vona, Jobbik’s leader, got 26% running in Heves-3, qualified for the runoff. It will be interesting to look at the runoffs in those constituencies, but also in those where the Greens and Jobbik are out by the first round to judge how their voters go between MSZP and Fidesz. Unsurprisingly the Greenies do best in Budapest with 12.81% and ahead of Jobbik (only 10.8% there, where the MDF wins its best result with 4.7%). In downtown Budapest (Budapest 9), the Greenies win up to 17% or so. The 58 national seats in the runoff should equalize things a bit in favour of the LMP especially but also MSZP and Jobbik who remain slightly under-represented by the current seat allocation. As always, and especially for Fidesz in this case, the easy part is over, the hard part is succeeding in government (and given how all but one government in Hungary since 1990 have failed to win re-election). Fidesz made little promises, and they campaigned largely on what can be seen as vote-winning sound bites but are in reality hard to implement (creation of 1 million jobs). Furthermore, with Hungary’s economy still in poor state, Fidesz will need to win further support from foreign lenders and investors, but at the same time it must be careful of not playing against strong nationalist aspirations at home (as well as attachment to costly social programs). Hungary goes to the polls on April 11 and April 25 to elect the 386 members of Hungary’s unicameral National Assembly, known as the Országgyűlés. 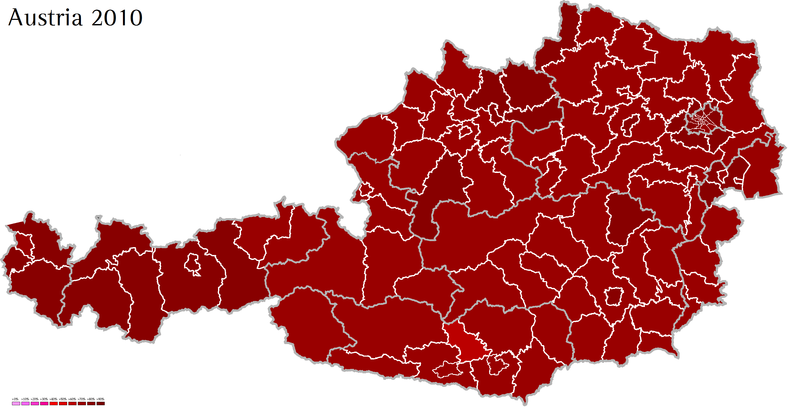 In the 2006 elections, the Hungarian Socialist Party (MSZP) and their former liberal allies (the Alliance of Free Democrats, SZDSZ) won a majority of seats: 210 seats for the Socialists and Free Democrats. The 2006 election marked the first time since the fall of the wall in 1990 that an Hungarian government won re-election. Hungary’s 386 Országgyűlés is elected through a complex system. There are 176 single-member constituencies, elected through a system similar to the one used in France. To win by the first round, a candidate requires more than 50% of the vote and turnout must be over 50%. If no candidate fits this rule, a runoff is held two weeks later between all those candidates polling over 15% of the vote. A plurality is required in the runoff, and there is a 25% turnout minimum for the vote to be valid. On another ballot, voters elect 152 members through Hagenbach-Bischoff PR, in the context of 20 constituencies (Hungary’s 19 counties and Budapest). There is a 5% threshold for parties, a threshold which increases to 10% for coalitions between 2 parties and up to 15% for coalitions between 3 or more parties. The remaining 58 seats are allocated on a national list to compensate parties for disparities between the popular votes and constituency seats. No votes are actually cast for this national list, and these seats are allocated through d’Hondt among parties that qualify for the distribution of regional constituency seats. note: Hungarian names are referred to in a last name-first name order. Names here use the Western name order. Hungary is a polarized country, with power usually concentrated in the hands of two parties of roughly equal strength, and election results have been as such since 1998. The first election after the fall of the wall, in 1990, saw the conservative Hungarian Democratic Forum (MDF) win a large victory over the SZDSZ, which represented the old liberal middle-class opposition to the communist regime. The ‘incumbent’ government, represented by the MSZP, which was in fact the renamed but unreconstructed communist MSZMP, took only 11% of the vote and 33 seats. Fidesz, the Hungarian abbreviation for ‘Alliance of Young Democrats’, was a liberal opposition movement largely dominated by university students and young thinkers, and won only 9% of the vote and 21 seats. Jozsef Antall of the MDF became Prime Minister, but his efforts at shifting Hungary’s economy from a state-led socialist economy to a liberal free-market economy were unpopular because of the toll it took on jobs and consumer prices. The MDF’s conservative policies on matters such as religious education made it run into the SZDSZ. In 1994, with a struggling economy and a reconstructed MSZP acceptable to the middle-class, the MSZP won a landslide victory winning an overall majority (209 seats by itself) and around 31% of the vote. The SZDSZ was unable to capitalize on the MDF’s unpopularity, and its vote fell slightly but it became the junior partner in the Socialist government led by Gyula Horn. The MDF, with only 12%, saw its caucus membership fall by 126 seats. Fidesz, after winning only 7% of the vote, under the leadership of Viktor Orbán, transformed itself from a libertarian party into a conservative party, capitalizing on the MDF’s destruction. In 1998, the tough austerity policies (including a number of privatizations and cuts) of Gyula Horn’s government were sanctioned by voters, who turned to Orbán’s Fidesz, by now a conservative party albeit one running on some left-wing rhetoric (improvement in welfare payments). Fidesz, although winning less votes than the MSZP, won 148 seats to the MSZP’s 138. Through a coalition with the MDF and the old Independent Smallholders’ Party (FKGP), Orbán became Prime Minister. Despite positive economic numbers (thanks partly to Horn’s policies but also tax cuts and social insurance contributions cuts), Orbán was assailed for being arrogant in his style and a number of scandals emerged, one which totally destroyed the FKGP. Led by former finance minister Péter Medgyessy, the MSPZ and its traditional ally, the SZDSZ, narrowly defeated the incumbent Fidesz-MDF coalition. In a polarized election which saw only the three major parties/coalitions win seats, the Socialist-liberal alliance won 198 seats to the right’s 188 seats. Medgyessy, a poor leader, lasted only two years, being succeeded by Ferenc Gyurcsány, a young communist turned successful businessman. Thanks in large part to alleged good economic times, Gyurcsány won an unprecedented second term in office, with his party winning 186 (plus 6 joint MSZP-SZDSZ candidates) and 18 seats for the SZDSZ. Fidesz won 164 seats, and the MDF won 11. However, Gyurcsány soon ran into bad waters, when a post-electoral secret tape of Gyurcsány admitting that he had lied to voters about the economic situation was released, leading to massive protests and a large Fidesz victory in the October 2006 local elections. In addition to lingering voter suspicion of Gyurcsány’s policies, the country was hit especially hard by the economic crisis, an economic crisis which saw Hungary’s unemployment rate grow, and its budgetary deficit increase. Gyurcsány was assailed for his poor management of the economic crisis by both Fidesz (claiming his policies hurt the people too much) and by foreign economists (saying that he hadn’t cut spending enough). Gyurcsány was ultimately forced to step down in favour of Gordon Bajnai, a young businessman, who implemented radical shock treatment for the economy, including cutting spending to the delight of foreign investors and the IMF, who have bailed out, in a way, Hungary. However, still hurt by Gyurcsány’s lies, in addition to a shock treatment which is taking its toll on popular social programs and jobs, the Socialists are polling absolute lows. Fidesz, which, ironically, tends to be a more statist party compared to the Socialists, has benefited from this and it has been polling over 50% and sometimes over 60% since around late 2006. In the 2009 European elections, the party won 56.36% of the vote against 17.37% for the MSZP. Viktor Orbán, still the leader of Fidesz, is running on a vague platform supporting the creation of over a million jobs and prosecuting corrupt politicians. In fact, Fidesz has made little – if any – promises in this election. After Gyurcsány’s promises in 2006, it seems that electoral promises left a bad taste in the voter’s mouth. The party claims that it would be foolish to make promises it may not be able to fulfill. The MSZP’s kamikaze candidate for Prime Minister is the 36-year old Attila Mesterházy. Mesterházy’s vague promises of punishing those corrupt is not striking a chord with voters at all. However, Gyurcsány’s lies have hurt the fundamental bases of Hungarian democracy and the economic crisis, with the IMF’s shock treatment and the flow of foreign creditors, have awoken a sleeping but eternally present nationalist feeling. In fact, around 4 million Hungarians (of around 14 millions ethnic Hungarians) live outside Hungary, the result of the 1920 Treaty of Trianon which removed two-thirds of the nation’s territory (Hungary received, proportionately, the worst punishment from the Allies after the First World War). In contrast to the nationalist and irredentist policies of Hungarian dictator Miklós Horthy between the wars, the communist regime and the democratic governments have led a more pragmatic policy vis-a-vis the fate of Hungarians in Romania, Slovakia or Vojvodina. Fidesz, while in government, passed a controversial ‘status law’ for the Hungarian diaspora and supported a 2004 referendum (which was defeated) giving dual-citizenship to Hungarians abroad. The MSZP, on the other hand, is known for its opposition to such policies and distinguishes itself by its relative lack of Hungarian nationalist policies. However, the nationalist policies of the Slovakian government and worsening inter ethic relations in Slovakia between Slovaks and Hungarians have hurt relations between the two countries, and the flow of foreign investors have led to the rise of resentment of foreigners and Europe as well as nationalist feelings (a bumper sticker of Greater Hungary is one of the nation’s most popular bumper stickers). The Movement for a Better Hungary, known as Jobbik, has managed to make itself the voice of these feelings. Taking votes from right-wingers who see Fidesz as too liberal and former Socialist voters disappointed by the MSZP, Jobbik blames Hungary’s problems on its Roma minority (5-7%), the EU, the political elite both left and right, and Jews. Jobbik’s SA-like paramilitary wing (outlawed in 2009 but recently re-created) has sparked growing tensions between Hungarians and Romas, with the result of increasing nationalist feelings. In terms of the European far-right, they’re probably the closest you can get (amongst serious parties with a significant electoral audience) to the 1930s NSDAP in Germany. The party won a record 14.77% of the vote in the European elections, much higher than what polls had predicted, leading to the fear that its support might be underestimated. Recently, Jobbik has been hit by media allegations against some of its members, including Gábor Vona. On the other hand, the liberal and internationalist SZDSZ, which left the coalition in 2008 reducing the MSZP to a minority, won only 2% of the vote in the European elections and has been entirely wiped off the political map. The MDF, although saving one seat in the European Parliament in 2009, has suffered a similar fate. On the other hand, the green movement, known as Politics can be Different (LMP) has picked up speed, likely from Socialist voters and represents the expression of discontent with the MSZP to its left. A two-thirds majority (258 or so) would allow Fidesz alone to amend the constitution, and a three-fourths majority (290) would allow Fidesz to adopt a new constitution entirely. Fidesz will win easily, but they will have big expectations. They will need to please the Hungarian public, by creating jobs and maintaining welfare and social programs; but they’ll need to please foreign investors and the IMF in order to save the economy. Pleasing both is certainly not an easy task, and most foreign observers don’t have high hopes for Fidesz once in office. Will the 2014 election see the return of the MSZP…? 13 of Italy’s 20 regions voted in regional elections on Sunday, March 28 and most of Monday, March 28 to elect their regional President and regional Council. All the regions which voted on the 28th and 29th are “ordinary status” regions – that is regions with less autonomy than those “home rule regions” (Sardinia, Sicily, Trentino-Alto Adige/Südtirol, Aosta Valley and Friuli-Venezia Giulia) who in return keep only 20% of taxes levied. These regions were first established as autonomous entities with some legislative autonomy in 1970, and the Regional Council was originally elected entirely by proportional representation and the President of the Region was elected by council (like in France). Since 1995, regional Presidents have been elected in a separate ballot and a “majority bonus” has been added to the electoral system for Regional Councils. Abruzzo voted in the last regional elections in 2005, but a “special election” was held in 2008 following the resignation of the incumbent. Molise also votes off-sync because of a similar situation in 2000/2001 or something. The President is elected on an entirely separate ballot, and only a plurality suffices for him/her to be elected. Four-fifths of the regional councillors are elected by proportional representation in the context of provinces (the small number of seats in some provinces is another boost for stable majorities) where the threshold is 3% unless a list is “connected” to a “Presidential list” which has won 5% in which case it can get seats even if under 3%. The remaining fifth of seats are given to region-based “Presidential lists” which are linked directly to the Presidential candidate. This is a simplistic and cursory explanation of a very complex (typical Italian politics, I guess) electoral law. This also only applies to 8 of the 13 regions, since Calabria, Campania, Marche, Apuli and Tuscany have adopted slightly different systems. The last election for the 5-term Regional Councils were held in 2005, when Berlusconi was in power but under an earlier cabinet. 2005 was the height of Berlusconi’s unpopularity, which did subside and led to his narrow defeat in 2006. Coming into 2005, the right was defending 8 (or 7 of the 13 up in 2010) regions against 6 for the left. Coming out of the 2005 elections, the left held 12 (or 11 excluding Abruzzo. Abruzzo is now held by the right following the 2008 election there) against only 2 (Lombardy and Veneto) for the right. 2005 was highwater mark for the right, and not a ‘normal’ or ‘average’ regional election. Turnout had been 71.4% in 2005. In a campaign dominated by Berlusconi’s hyper-activity in the context of the campaign, the vote became a major test for Berlusconi ahead of the 2013 general elections and a mid-term plebiscite on his term. He has a 44% approval rating, but his coalition continues to lead voting intentions by a large margin. The right downplayed expectations, with major hopes on 2 regions: Calabria and Campania in the south, traditionally on the right. It also played hard in Piedmont and Lazio (which includes Rome). In Veneto and Piedmont, the right’s presidential candidate are both members of Umberto Bossi’s far-right regionalist Lega Nord, a close but very demanding ally of Berlusconi in Rome. Bossi obviously has his eyes, along with former AN leader Gianfranco Fini on the post-Berlusconi era. Turnout was 64.2%, the lowest for such an election in a long time and significantly lower than in 2005. Here are the total results by coalition of the list vote for Regional Councils. The major point of this election is the victory of the right. Despite Berlusconi’s declining numbers, and a situation (poor economy, personal and political scandals against Berlusconi) going, one would think, fully in the left’s direction, the right has managed to win, a narrow win, but a win in unfavourable times, one would think, for Berlusconi’s right. The Italian left, which has problems of its own, such as lack of strong leadership (or of a leader with Berlusconi’s charisma and media appeal) and its inability to build momentum behind a fledgling and divided PD, has taken another defeat in an election it was supposed to win. Within the right, the historic result of the Lega Nord (12.28%) is the major point of interest, and it provides a lot of the right’s support because support for Berlusconi’s PdL (26.78%) has declined since elections 2008-2009, but not to the benefit of the PD (26.1%), which stagnates at its 2009 level. Strong with 12% of the vote, and two regional Presidents, Umberto Bossi, with his eyes already on Berlusconi’s succession, will become a very demanding coalition partner. He has already demanded more fiscal autonomy for the north, and it is unlikely to be his last demand from Berlusconi. And with the votes behind him, Bossi has, to date, a very favourable outlook for the future. Bossi’s success is a dark spot on Berlusconi’s success in these elections. On the left, there is not much movement since 2008-2009. While Antonio di Pietro’s anti-corruption Italy of Values (IdV) has seen its strength (8% in the Euros) subside a bit to fall to 7.27%, the PD stagnates at its 2009 level of 26.1%. The Left Ecology Freedom (SEL) of Apulian regional President Nichi Vendola wins 3%, ahead of the 2.74% won by the Communist Refoundation-led and dominated Federation of the Left. Francesco Rutelli’s splinter Alliance for Italy isn’t off to a very inspiring start with merely 0.58% of the vote. The UDC doesn’t poll great, and it obviously isn’t going ahead much in its pursuit of a centrist governing alternative. But its support was likely helpful for the right and left in the regions where it didn’t run independently (in all regions where it didn’t run independently, it supported the eventual winner in all regions but Piedmont). It’s strategy of ‘geometrically variable alliances’, with left here and right here seems to be sustainable for the UDC in the future, and it could give idea to Bayrou across the border in France. The success of the 5 Star Movement, led by the popular comedian Beppe Grillo, is also notable. It’s success comes on the back of young disaffected voters (or left-leaning young voters) who, with Grillo’s new movement, registered a vote against the PDL-PD party system and against the stock of politicians, uninspiring to them and many, on left and right alike. The high number of non-voters is also a sign of discontent with Berluconi, but discontent also with the current Italian left. Overall, Berlusconi wins, and that’s undeniable, but the division of the left and the left’s inability to present itself as something new and stand for change plays an important role in his victory. Furthermore, his victory is clouded by the Lega’s very strong showing, something which will likely spell trouble in the future for Berlusconi. Here are the results by region. Indicated in brackets are the number of seats won by the presidential candidate’s coalition. Nichi Vendola, a gay communist, had won the first ever primary elections in Italy in 2005 ahead of the regionals, and his victory against the right’s incumbent in a conservative and very Catholic region had been a major surprise then. Vendola remains outside of the PD, and he is now the leader of a new party (he left the Communist Refoundation Party in 2008 following his defeat in a leadership v0te) called Left Ecology Freedom (SEL). He easily won the PD primaries and faced two candidates: the unknown candidate of the PdL and UDC Senator Adriana Poli Bortone, leader of a local Apulia-based outfit called Io Sud (I South). Vendola has seemingly managed to build up a strong base in Apulia, which is somewhat surprising, but in southern Italy, which is quite pro-incumbent, the candidate often matters more than party. The left scores 46.05% on the council vote (46 seats), against 44.22% for the right (26 seats) and 9.43% for the UDC (4 seats). Vendola’s SEL wins 9.74% and 11 seats. Basilicata, although located in southern Italy, has tended to the left since the beginnings of the so-called Second Republic (likely due to its poverty, Basilicata is one of the south’s poorest regions), but it conserves certain traits common to southern Italian politics, such as pro-incumbency. De Filippo, elected by a large margin in 2005 (67% of the votes) has been re-elected by a smaller but similarly large margin. Magdi Allam, a famous ex-Muslim Italian journalist and UDC MEP (now famous for his strong views against Islam and his defense of Judeo-Christian values) won 8.7% and one seat, though the UDC was associated with the left. In fact, most politicians on the left in this region are former members of DC, which was strong in the region and throughout southern Italy. The left has 67.56% of the votes in the council election (16 seats) against 27.24% for the right (9 seats) and 4.26% for Magdi Allam’s I Love Italy-Io Sud coalition which wins one seat. Behind De Filippo, the UDC won 7.39% of the vote and 2 seats but IdV won 9.93%. Calabria, a traditionally conservative region in southern Italy, switched to the left in 2005 but it has returned to the right by a large margin. The incumbent, who was seeking a second term, found an IdV candidate on his way, possibly the result of Loiero’s problems with the judiciary recently (though he was acquitted of corruption for lack of proof). However, the popularity of the right’s candidate, who is the popular mayor of Reggio Calabria probably explains a lot more about the right’s crushing victory in the region. On the local vote, the PdL has 26.39% of the votes against 15.79% for the PD. A “non-party” list which supports Scopelliti (such lists are quite common in Italian regions) won 9.94%. In an old stronghold of Christian democracy, the UDC has 9.39% (far ahead of IdV, only 5.39% for its lists despite over 10% for its candidate – who was a famous and popular local businessman). Incumbent Antonio Bassolino (PD), a popular former mayor of Naples is retiring after 2 consecutive terms. First elected in 2000, he won re-election in 2005 by a large margin (61.6% against 34.4% for the right) for a region which typically leans to the right. However, with Bassolino leaving office with a relatively poor second-term record and the left faced with a former Socialist (PSI, a party which was socialist in name only in later years) cabinet minister, it had little hope going into the vote. The presence of a candidate for the so-called 5 Star Movement, a party launched by popular Italian comedian Beppe Grillo and which builds up on young voters’ discontent with the PD-PDL party system. The right has 58.6% of the votes for the regional council (38 seats) against 38.5% for the left (21 seats) and 1.56% for the PRC. The old UDEUR, which semi-died after precipitating Prodi’s fall in 2006, made a comeback in their stronghold with 3.35% region-wide and 2 seats on the right’s slate. Caldoro, who is actually a member of the Nuovo PSI allowed a Nuovo PSI list to take 5.79% of the vote and 4 seats. The far-right La Destra, associated with the right nowadays, wins one seat with barely 1% of the vote. On the left’s slate, Franceso Rutelli’s new party, Alliance for Italy won 3.04% but no seats. Emilia-Romagna, a part of the Red Quadrilateral of central Italy, is a stronghold of the left. Vasco Errani, seeking a third term, had won 62.7% of the vote in 2005 faced no trouble from the right. But the campaign was rather fair play, and the candidates of both major coalitions and the UDC held a joint press-conference at one time before the election. These factors plus youth discontent with the Italian political system probably gave fuel to the Beppe Grillo movement, which, with 7% of the vote and 2 seats, wins its best result in the country. The PD dominates the list vote with 40.64% and 18 seats, with the left standing overall at 51.92% (22 seats) against 38.31% for the right (14 seats), 6% for Grillo and 3.75% for the UDC. In a region where the Communist Party used to dominate, the PRC and its allies win only 2.79% of the vote and is left with 1 seat. However, the Lega Nord, breaks through into central Italy with a record 13.67% and 4 seats in the region, more ‘central’ than ‘northern’. The race in Lazio, which includes Rome, was the big race. Piero Marrazzo (PD) was elected in 2005, defeating the right’s incumbent Francesco Storace (now leader of La Destra) with 50.7% of the votes against 47.4% for Storace. Marrazzo resigned in October 2009 before a sexual scandal was going to break, leaving the region without a leader and the left without a candidate. A number of names were evoked for the PD’s candidacy, including Walter Veltroni, before former European Commissioner and leader of the Radical Party Emma Bonino got the spot. She faced right-wing trade unionist Renata Polverini (who had problems handing in her candidacy on time, fixed in time by Berlusconi’s government). Despite leading in all polls and early returns, Polverini defeated Bonino probably on basis of the votes of Rome’s suburbs (Bonino won the province of Rome itself). The right’s victory here is a major gain, given that it includes Rome. The right has 51.38% (30 seats) against 48.29% for the left (28 seats) in the list vote. A surprising thing is that Polverini’s ‘non-party list’ dominates the list vote on the right with 26.33% and 17 seats against only 11.86% for the PdL. Storace’s La Destra, with 3.99%, wins 2 seats in a region which has traditionally been the base of Italy’s post-fascist movements (MSI and later AN). On the left, the Panella-Bonino/Radical list wins 3.3% and 2 seats, though the PD with 26.28% wins it for the left. IdV, with 8.61%, also does well. A repeat of the 2005 race between Burlando and Biasotti in a region polarized between two different political regions: the east around Genoa, far more industrial, on the left; and the west, wealthier and less industrial on the right. Biasotti had been President between 2000 and 2005 until he was defeated 46.6-52.6 by Burlando in 2005. The same pattern repeated itself in 2005 with a similar margin and similarly divided map, but the left won. Liguria wasn’t one of the right’s major targets, so losing it won’t be considered bad for it. The left has 52.72% (17 seats) against 47.27% (14 seats) for the right’s coalition in the list vote. Lega Nord, with 10.22% polls below national average (but higher than in the 2009 Euros), but Liguria, although northern, isn’t a strong region for the Lega Nord, which does better in mountainous areas. 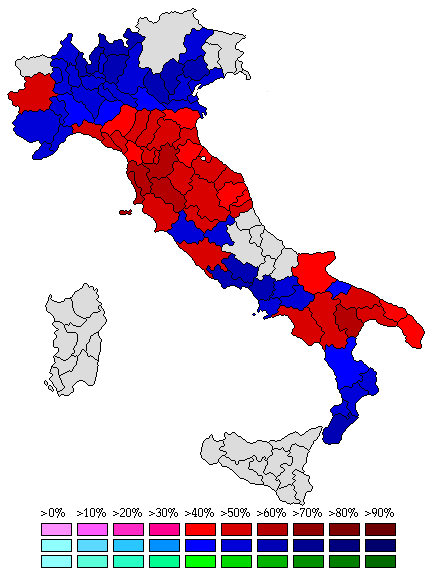 It remains funny to see the LN doing better in Emilia-Romagna, a ‘central’ region than in Liguria, more northern. On the list vote, the right has 58.15% (41 seats) against 33.34% for the left (27 seats) and 3.84% for the UDC (3 seats). In Umberto Bossi and the Lega Lombarda’s birthplace, Bossi’s party wins a record 26.2% of the vote and 18 seats, pushing the LN ahead of the PD (22.89%), although the PD holds more seats (21) than the LN. The party also wins strong results in its base in the Pedemontana of Lombardy: 42.4% in Sondrio, 36.9% in Bergamo, and even up to 17.25% in the province of Milan. Marche is largely within Italy’s Red Quadrilateral, and has been held by the left since the first direct elections for President in 1995. First elected in 2005, Spacca had defeated the right with 57.8% of the vote then. However, the independent candidacy of a communist, which managed to poll a respectable 7%, probably due to the fact that the communist candidate (supported by the PRC and its allies as well as Vendola’s SEL) is a former provincial president (Ascoli Piceno, where he polled 9.1% of the vote). On the list vote, the left has 53.36% (25 seats) against 40.12% for the right (14 seats) and 6.51% for the communists (2 seats). Lega Nord, with a record 6.32% and 2 seats breaks through in a region which is quite far from the party’s bases in the north, showing that the Lega is slowly breaking through in central Italy. On the left, Rutelli’s Alliance for Italy wins 2.01% and 1 seat while IdV does well with 9.06% and 4 seats. Piedmont, which usually leans to the right despite the left’s strength in Turin, was narrowly gained by the leftist Mercedes Bresso from the right’s incumbent Enzo Ghigo in 2005 with 50.9% against 47.1% for the right. Piedmont was a key region for the right, but one where the right’s top candidate was from the Lega Nord: in this case, Roberto Cota, the leader of the Lega’s local branch. Despite polls favouring the left and early results also favourable to the left, Bresso ended up losing by a very narrow margin to Cota, though the swing to the right in Piedmont was not as large as in some other places, probably a result of some voters (notably UDC voters, the UDC supported Bresso despite her atheism) on the centre-right being reticent about voting for a Leghista candidate. Another factor which contributed to Bresso’s defeat was the strong showing of the 5 Star Movement, whose 4% probably hindered Bresso as most voters, one would assume, are left-leaning. In the list vote, the left is ahead with 47.54% (21 seats), but the right with 46.98% has more seats (24). The 5 Star Movement, with 3.66%, wins two seats while the bunch of fascists, eurosceptics and others behind Rabellino win 1.8% and obviously no seats. On the right, the Lega Nord wins 16.74% and 9 seats, a good result for a region where the Lega is weaker (compared to Lombardy and Veneto). On the left, the UDC, with 3.92% wins only 2 seats, a rather bad result for them. Tuscany is at the core of Italy’s Red Quadrilateral, and has been a stronghold of the PCI first and the post-1992 left. It is also the region where the various communist parties formed after the PCI’s collapse have found their strongest support, a base which allowed them to run independently of the left in 2005 and win 7% of the vote. The incumbent, Claudio Martini, re-elected in 2005 with 57.37% of the vote against 32.8% for the right, was retiring in favour of Enrico Rossi. With 59.7%, he wins the left’s second best result after its crushing victory in Basilicata. The left does even better on the list vote with 60.7% and 19 seats, while the right has 33.6% and 13 seats and the UDC has 4.8% and 1 seat. Tuscany uses an absurdly complex electoral system, which seems to shut out all other parties on the left than the PD (42.2%), including IdV (9.4%) and the communists (5.27%). However, IdV gets 5 other seats somewhere while 3 go to the communist list (PRC). On the right, Lega Nord wins a record 6.48% and gets 2 seats. The small inland region of Umbria, sandwiched between the Lazio and Marche, is sometimes called the “Mezzogiorno of central Italy” and falls entirely within the Red Quadrilateral. The left’s incumbent, Maria Rita Lorenzetti, who won 63% in 2005, is retiring after 2 terms. The PD’s candidate, the young Catiuscia Marini had no trouble succeeding her in a very left-wing region. With 57%, she trounces the right which polls 37.7% (still higher than its 33.7% in 2005). On the list vote, the left polls 58.91% (13 seats) against 36.7% for the right and 4.38% for the UDC. The PRC achieves an honourable result of 6.86% and 2 seats, while a socialist list on the left’s slate wins 4.16% and 1 seat. On the right, again a breakthrough for Lega Nord, which wins 4.33% and 1 seat in its weakest region (where it’s organized, at least). A conservative, generally rural and Catholic region, Veneto was one of the right’s two victories in 2005, thanks in part to the popularity of its incumbent, Giancarlo Galan who won 50.6% of the vote against 42.4% for the left. However, after 3 terms in office, Giancarlo Galan was forced to step aside by the right in favour of a candidate from Lega Nord (very strong in the region), Luca Zaia who is also Berlusconi’s incumbent Agriculture Minister. Zaia, who is also very popular, including with traditionally left-wing voters, was seen by all on the right as the best candidate and Galan was forced to step aside. Galan’s forced retirement led to an independent UDC candidacy around former MEP and incumbent deputy Antonio De Poli, who polled a respectable but disappointing 6% (some polls had given him over 10%). Zaia is the only candidate of the right to win over 60% of the vote. The right has 60.7% on the list vote (31 seats) against 29.32% (18 seats) for the left, 6.46% (4 seats) for the UDC and 2.57% for the 5 Star Movement. The Lega Nord in Veneto wins its best result ever with 35.15% and 18 seats, far ahead of the PdL which has only 24.74% and 13 seats. The party even wins a staggering 48.5% in the province of Treviso, an old stronghold of the local LN and also Zaia’s home province. Four provincial elections (L’Aquila, Caserta, Viterbo, and Imperia) were also held as well as a number of communal elections in cities including Venice. In the four provinces up, all were ruled by the left except Imperia. Now, all are ruled by the right. In L’Aquila, which suffered a large earthquake over a year ago, the right has won a lot of support in the province thanks to its rebuilding efforts, and L’Aquila logically switched to the right, with the right winning 53.4%. In Caserta, the right won 64.4%, picking up the province from a retiring PD incumbent. In Viterbo, the right won 54.7%, also picking up an open seat. In Imperia finally, the right, with 59%, holds an open seat. Full results on La Repubblica. A vast number of municipalities held elections, in fact all regions except the special status had some municipalities up for re-election. La Repubblica states that of the major cities up, the left was defending 44 and the right 28 (2 were held by the centre and 1 was held by an independent ‘civic’ list). After the first round, the left has 15 against 18 for the right and 40 will go into a runoff. The race in Venice was the most watched of all, with incumbent PD mayor Massimo Cacciari retiring. The right’s candidate was none else than Berlusconi’s popular and bubbly Public Administration Minister, Renato Brunetta. He faced the left’s Giorgio Orsoni. In a somewhat surprising result, Orsoni defeated Brunetta with 51.1% against 42.6% for Brunetta, a result which will be a bright spot on a bad day for the left. Other than that, the left picked up Lecco while the right picked up Chieti and Andria. A majority of municipalities will hold a runoff on April 11 and 12. Trentino-Alto-Adige holds local elections on May 16 with runoffs on May 30. Full results on La Repubblica.